Application Fee: Applications should be accompanied by a non-refundable crossed Demand Draft of Rs.100/- (Rs. One hundred only) towards application fee drawn in favor of the ‘Director, Central Board for Workers Education, Nagpur’ payable at any nationalized bank at Nagpur. Application Fee : Rs.100/- in the form of DD in favour of Delhi Development Authority payable at New Delhi. No fee for SC/ST candidates. How to Apply : Applications in prescribed format complete in all respects should be sent, so as to reach the Dy. Director (Personnel) - IV, DDA, B - Block, 3rd Floor, Room No. 315, Vikas Sadan, New Delhi­- 110023, latest by 10/04/2012. United Bank of India invites applications for the post of Probationary Officers from Indian citizens who have taken the Common Written Examination for Probationary Officers/ Management Trainees conducted by IBPS in 2011-12 and have a valid Score card issued by IBPS. Selection Procedure: Selection for the post of `Probationary Officer will be made on the basis of performance in Common Written Examination (CWE) conducted by IBPS in September 2011including supplementary examination held in November 2011 and the marks obtained in Group Discussion and/Interview. How to Apply: i) Candidates are required to apply online through website :www.unitedbankofindia.com No other means/ mode of application will be accepted. 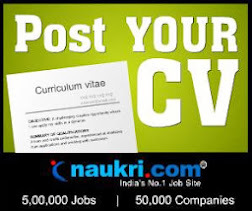 (ii) Candidates should ensure that their personal email ID (as specified in the online application form while applying for Common Written Examination CWE conducted in September 2011) is kept active during the currency of a recruitment project. Bank will send intimation for call letters for Group Discussion and / Interview etc. to the registered e-mail ID. Allahabad Bank invites applications for recruitment of 1600 Probationary Officers from Indian citizens who have taken the pre-requisite Common Written Examination (CWE) for Probationary Officers/ Management Trainees conducted by Institute of Banking Personnel Selection (IBPS), Mumbai in 2011-12 and have a valid Score card issued by IBPS. Pay Scale : Rs. 14500 - 25700, Age : 20-30 years as on 01/07/2011. Qualification: Graduate in any discipline from a recongnised University/Institution. Selection Procedure: Common Written Examination (CWE) conducted by IBPS : Candidates should have appeared at Common Written Examination conducted by IBPS in September, 2011 or subsequently and should have obtained the minimum category-wise cut-off in the Total Weighted Standard Score (TWS Score) as stipulated by the Bank to become eligible and are in possession of Valid Score Card. Depending upon the number of category-wise vacancies, only a certain number of eligible applicants in the descending order of Total Weighted Standard Score (TWS Score) in the Common Written Examination (CWE) conducted by IBPS, Mumbai in respective category will be called for Group Discussion and Interview or only interview at the discretion of the Bank. How To Apply: Candidates are required to apply On-Line through website www.allahabadbank.in No other means/ mode of application will be accepted. (ii) Candidates should ensure that their personal e-mail ID (as specified in the On-Line application form while applying for Common Written Examination (CWE) conducted in September, 2011) is kept active during the currency of this recruitment project. Bank will be sending intimation for call letters for Group Discussion and / or Interview through the recorded e-mail ID. Under no circumstances, he/she should share/mention email ID with/of any other person. Qualification : Degree from a recognised University with the related subject or its equivalent with a minimum of 50% marks in aggregate. For Credit Officer – The candidates having degree/diploma in Banking & Finance. For Marketing/Wealth Management Officer – The candidates having degree/diploma in Marketing/Finance/Banking. For Chartered Accountant – The candidate should be qualified Chartered Accountant. HOW TO APPLY: All eligible candidates should apply on-line through the link provided to our website www.mbgbpatna.com in the prescribed format from 15-02-2012. Please note that the last date for submission of on-line application is 15-03-2012. Candidates should have a valid e-mail ID. It should be kept active during the currency of this recruitment project. This will help him / her in getting call letter / interview advices etc. under no circumstances he /she should share / mention e-mail ID to / of any other person. In case a candidate does not have a valid personal e-mail ID, he/she should create his/her new e-mail ID before applying on-line. Sector - 1, Salt Lake, Kolkata - 700064. Application Fee: Rs. 200/- for General/ OBC and Ex-servicemen (Rs. 50/- for SC/ST/PWD candidates). The fee should be deposited in the cash at CBS branches of UCO Bank through Payment Challan only. How to Apply: Candidates are requested to apply On-line between 27/02/2012 and 17/03/2012 only through UCO Bank's website. admissible allowances to the Central Government employees from time to time. They will be governed under CISF Act and Rules as well as Central Civil Services Rules applicable to other members of the Force and other Acts and Rules applicable from time to time. On appointment they shall be entitled for the pension benefits as per the “New Restructured Defined Contributory Pension Scheme” applicable for the new entrants to the Central Government services w.e.f. 01-01-2004. Qualification : The candidate should have passed Matriculation or equivalent qualification from a recognized Board. Educational certificate other than State Board/Central Board should be accompanied with Government of India notification declaring that such qualification is equivalent to Matric/10th class pass for service under Central Government. How to Apply : Application should be sent so as to reach the concerned DIG of CISF as shown in the para-5 above by 25-02-2012 and in case of residents of North East region by 03-03-2012. No application will be entertained which is received after the due date. IARI conduct walk-in interview for the post of SRF Project (Project Code: 24-266/T4-1131) entitled : "Characterization of Xanthomonas oryzae pv. oryzae strains from North and North eastern regions with respect to biochemical, molecular, virulence profiles and genetic screening of Xop like effectors to investigate its role as virulence determinants to induce blight in rice"
Qualification : MSc in Plant Pathology/ Microbiology/ Biotechnology/Botany/Bacteriology as major. Name of the Project : "Gold Nanostructures and polymeric nanoparticles for breast cancer therapy"
Candidates may attend the Walk-in-Interview along with in the prescribed Bio-data form duly filled and all relevant original documents with a set of attested copies on 28/2/2012 Time: 9:30 am at NCCS Complex.